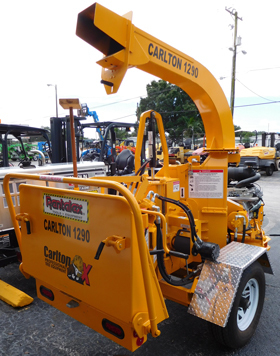 Carlton 1290 – 9″ capacity disk style chipper with dual hydraulic feed motors, hydraulic lift and crush cylinder, and a 35HP Vanguard big block gas engine. The 1290 is a heavy duty 9″ chipper designed for the landscape contractor and commercial rental store. The 1290 represents the best value in 9″ capacity chippers available. Belt Engagement System – Allows engine to run without disk engaged. Hydraulic Lift and Crush Cylinder – Aids in starting large ends and crushing. Digital Electronic Autofeed – Automatically starts and stops the feed of material based on engine RPM.